Not every Skrull is humanity’s enemy. Some are even among Earth’s Mightiest Heroes! Later this year, the Skrulls will make their live-action MCU debut in Marvel Studios’ “Captain Marvel.” But in the Marvel Universe, the shapeshifting race will be the focus of MEET THE SKRULLS, a new five-issue miniseries by Robbie Thompson and artist Niko Henrichon. The series will follow the Warners, a family of Skrulls placed on Earth to spy on humanity and potentially pave the way for an invasion. But not every Skrull has come to invade our planet. Even in Marvel comics, heroic Skrulls are not uncommon. To celebrate the upcoming release of MEET THE SKRULLS # 1 on Wednesday, March 6, we’re looking at a few of the Skrulls who have earned their place among Earth’s champions. Mutant Skrulls are discriminated against by the remains of their interstellar empire. Fortunately, the Skrulls have their own version of the X-Men: Cadre K! During “The Twelve” storyline, the X-Men encountered Fiz, a Skrull mutant who sided with them against Apocalypse. Professor Charles Xavier was so moved by the plight of Fiz and his friends that he left Earth to train them as a team. The young telepath, Z'Cann, serves as the leader of Cadre K, alongside Fiz, Goroth, Nuro, R'Tee, and Spunje. 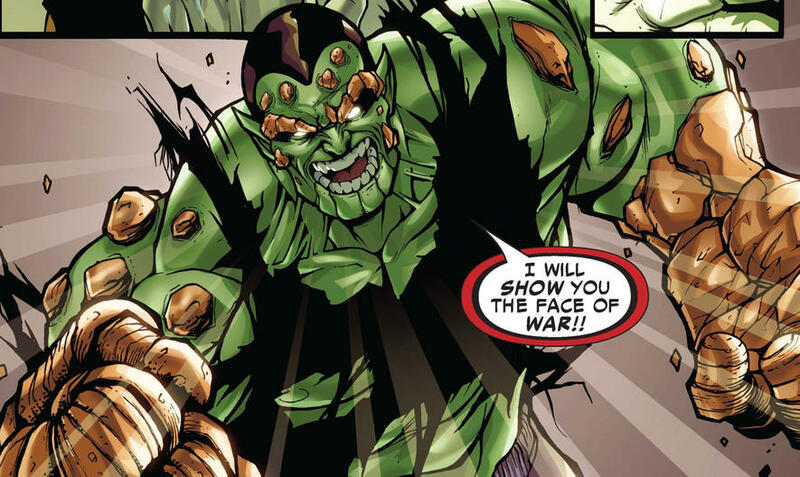 During the Secret Invasion, Z'Reg was one of the few Skrulls who had the courage to stand with the people of Earth. As Crusader, Z’Reg was a trusted member of the Avengers Initiative who helped them turn back the Skrull incursion. He was repaid for his heroism with a bullet to his head. Somehow, Crusader was able to transport himself away. But his survival remains in question. H'rpra was placed on Earth to spy on the Avengers as Mockingbird in preparation for the Secret Invasion. However, H'rpra was so deeply invested in her role as Mockingbird that she truly believed that she was a hero -- and acted accordingly, which resulted in her losing her life during the Avengers’ battle with Mephisto. Even in death, H’rpra continued to act as Mockingbird and helped relay a message from the afterlife that ultimately saved Patsy Walker from Hell. Most people don’t even realize that Hulkling is a Skrull. Technically, this Young Avenger is the child of the first Captain Marvel, Mar-Vell, and the Skrull Princess Anelle. The Kree and the Skrull don’t have many links between them, but Hulkling’s very existence is proof that their races can co-exist. And Hulkling has already put together a heroic resume that he can be proud of. In the ‘60s, John the Skrull came to Earth alongside three of his comrades who disguised themselves as the Beatles. John maintained his chosen shape when he joined the British agency, MI: 13, and he heroically resisted the Secret Invasion alongside Pete Wisdom and his teammates. Unfortunately, John the Skrull was executed by the invaders. However, his death was quickly avenged by Wisdom. While Alicia Masters recently married Ben Grimm in FANTASTIC FOUR #5, it wasn’t Alicia’s first marriage in the book. 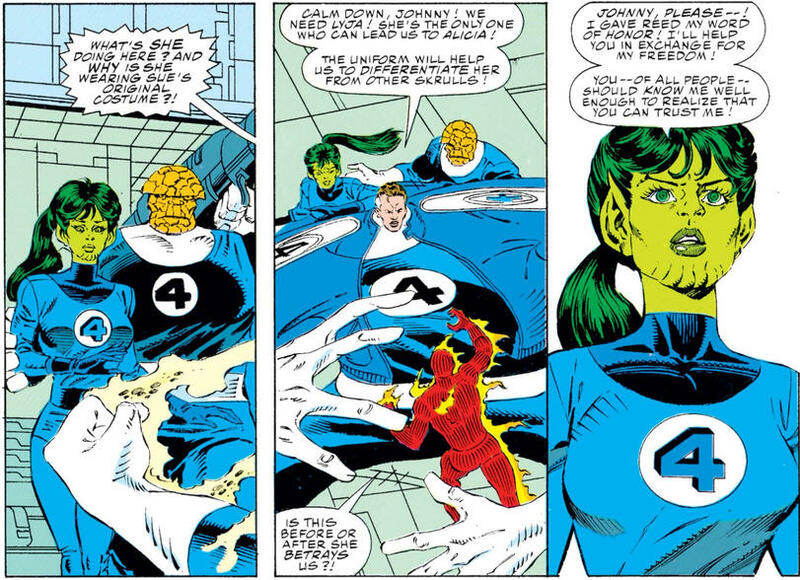 A Skrull named Lyja took Alicia’s place and started a relationship with Johnny Storm before marrying him in FANTASTIC FOUR #300. Years later, Lyja was exposed and forced to help the FF rescue the real Alicia. 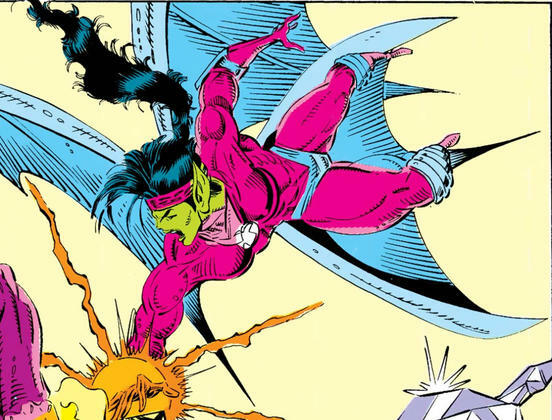 Because Lyja truly came to love her husband, she became an unofficial member of the team and worked alongside the FF up until the Onslaught incident. During the Secret Invasion, Lyja was strong-armed into sending the Baxter Building into the Negative Zone. But she ultimately aided her former friends and family. In the alternate timeline of the original Guardians of the Galaxy, Replica stowed away with the team and eventually earned her place beside them. Replica idolized the Guardians and sought to be a hero even in the face of discrimination from her teammate, Nikki. Replica also sacrificed her freedom to save the life her team by serving Protégé, an all-powerful god-like child. In the far future, Hercules’ best friend was an elderly Skrull mechanic who wasn’t above using his shape-changing powers to make a living as a female model. Skypii also proved to be a loyal companion to the Prince of Power, he was one of the best sidekicks anyone could ever ask for. Xavin was a Super-Skrull-in-training and the arranged mate of Karolina Dean of the Runaways. For Xavin, gender is truly fluid, and he became a she to better appeal to Karolina’s desires. Xavin loved Karolina so much that she joined the Runaways for a time, and allowed herself to be taken in Karolina’s place by alien abductors. MEET THE SKRULLS #1, written by Robbie Thompson with art by Niko Henrichon, goes on sale Wednesday, March 6. You can pre-order your copy today either online or at your local comic shop!